Sticky Traps and Roller Traps, used to trap flying insects and are used for monitoring pests over a fixed time period. 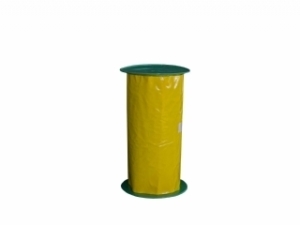 Yellow traps are particularly useful for attracting aphids, whitefly and leafminers and will also trap thrips. The blue traps are more attractive to thrips, hence the two colours. Such traps are also useful for picking up signs of pest invasion into a greenhouse from doors or vents and for monitoring population fluctuations over time. The dry-sticky TAKITRAP are double-sided with 4 removable panels (2 on each side) to monitor pests over a 4 week period or with 10 removable panels (5 on each side) to monitor pests over a 5 week period. 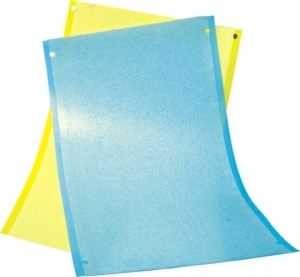 Two types of wet-sticky traps: panel traps and roller traps in blue or yellow. The glue is on both sides of the plastic trap, and is of the wet-sticky type. The large size of these traps offers maximum sticky surface and they are the most economical traps to buy. They are best hung free floating in the air space above plants. 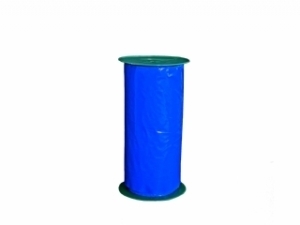 The strips are made of firm, but flexible Polyethylene for long life. There are three holes on each strip to facilitate fixing of the strips to string, nails or surfaces.